I have not ran since March (more on why below). 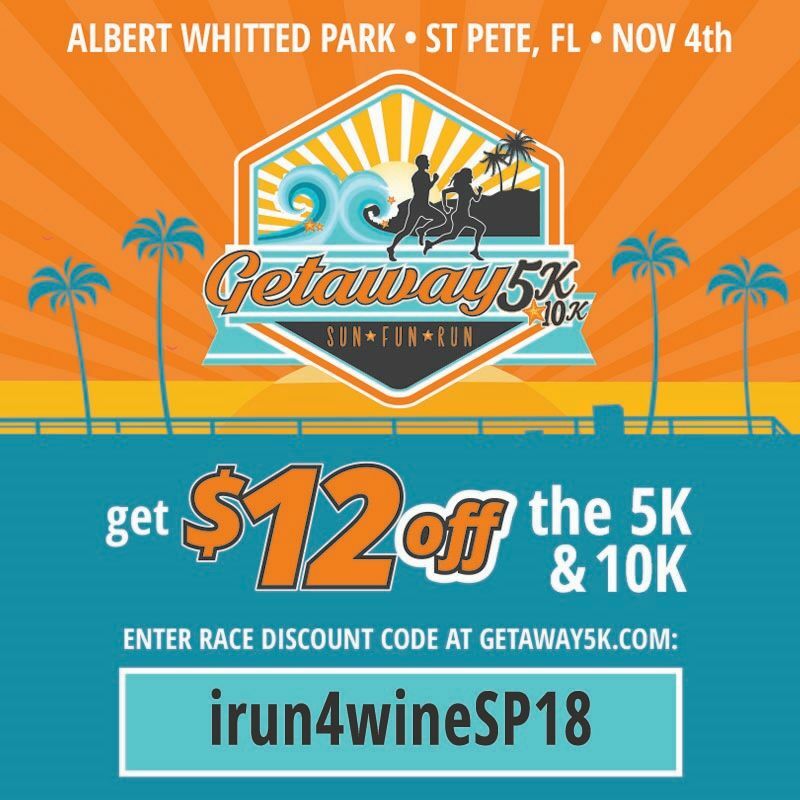 Now that I have that awful secret off my chest I am excited to announce that I am going to lace my shoes back up and start training for the Getaway 10K in St. Pete on November 4th. I helped spread the word of the 2017 Getaway series when it came to town last year but was unable to race it due to another race conflict. I had many friends who ran either the 10K or the 5K last year and loved it. I also have a discount code for either the Getaway 5K or 10K which will save you $12 off registration: irun4winesp18. I will have to start training from scratch which will be interesting to see how I mentally handle that. Will I go into this, constantly doubting myself since I know I can't run a mile straight right now? Or will it make me more determined? Time can only tell but I only have 4 weeks to get my act together. I could have chosen from many different races to get me over the hump. The reason I chose Getaway 10K was that it is a friendly race series that not only celebrates runners & walkers, it has a beach-themed post-race celebration with vendors, music, food & beverage and a play area for kids. The Getaway 10K and 5K swag is also fantastic. All 10K and 5K finishers will receive a specially designed finisher’s medal. All 10K finishers will receive a 1/4 zip, sweat-wicking pullover jacket, (with thumbholes!!) and all other race participants will receive an event t-shirt. 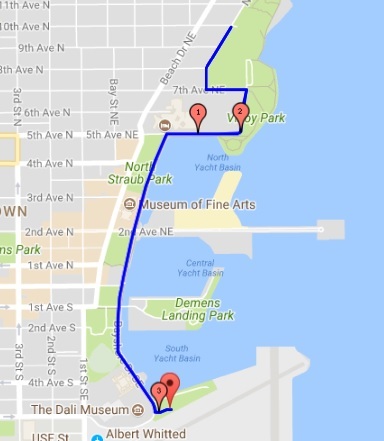 The Getaway 10K course is a timed run with the start and finish line at Albert Whitted Park. 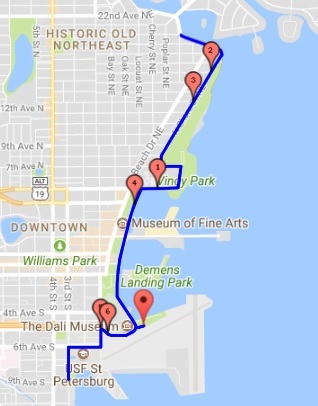 Runners will race through downtown St. Pete, pass the Dali museum and run along the water before returning to Albert Whitted Park for the finish line and the post-event party. The Getaway 5K course is a timed run with the start and finish line at Albert Whitted Park. Runners will race through downtown St. Pete while running along the water before returning to Albert Whitted Park for the finish line and the post-event party. If you are wondering why I haven't been running, there are reasons (and excuses). The reasons: In March, I got sick the night before a half marathon and ended up with my only DNS. I thought I had the flu and when I eventually went to the Dr., testing began. They believed I have had something called silent acid reflux for many years which has caused major havoc on my stomach. So although I never thought I had heartburn or acid reflux, my body was secretly suffering for many years untreated. This has now taken a more severe route and I've been to multiple Doctors to find no answers or relief. Seven months later, after thousands of dollars in Dr. bills and being put on 10 different medications, I still don't know what is wrong with me. I have to follow a gluten free diet and cut many other things out of my life. The past seven months have been a frustrating mystery. I finally got in with a GI Doctor and I have an endoscopy scheduled after the race. I will also be getting my esophagus stretched while I am under anesthesia since I have been choking on food & liquids. So while I know people run with way worse things than what I am going through, the few times I went out there was absolute torture. That's my reason for not running. My excuse is that it was too damn hot in FL to run over the summer with my ongoing issues..